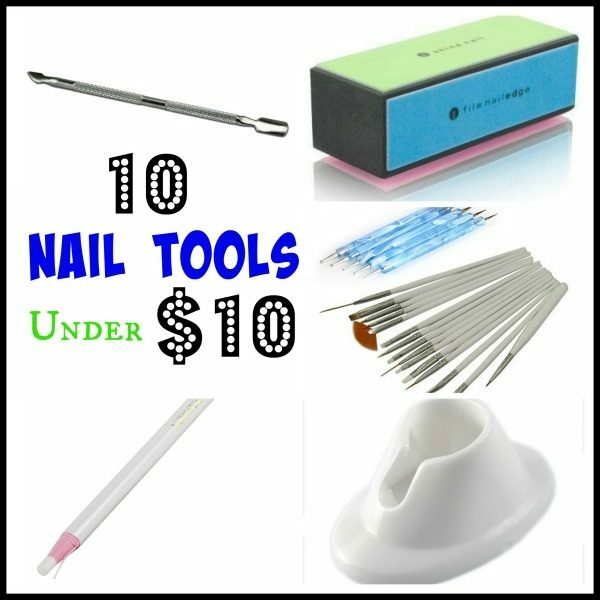 10 Nail Tools Under $10! You are here: Home / Great Deals / Amazon Deals / 10 Nail Tools Under $10! Like to do your nails? I sure do, and I’m always in the market for some new tools that won’t break the bank! If you’re like me, then you’re going to love our roundup of 10 Nail Tools Under $10! Set of 2 White Rubber Nail Polish Bottle Holders – $0.87 + $0.99 shipping! Rhinestone Picker Tool – $1.98 + FREE shipping! Stainless Steel Cuticle Pusher – $1.99 + FREE shipping! Acrylic Nail Clipper – $2.11 + FREE shipping! White Rubber Nail Stamp Tool – $2.99 + FREE shipping! 15 Piece Brush Set and 5 Piece Dotting Pen Tools Set – $3.80 + FREE shipping! Salon Express Nail Stencil Kit – $4.79 + FREE shipping! Nail Art Double Ended Stamper And Scraper – $5.27 + FREE shipping! 4 Way Shiny Block/4 Step Buffing Block – $5.60 + FREE shipping! Nail Art Drill KIT Electric FILE Buffer Bits Acrylics – $7.66 + FREE shipping!